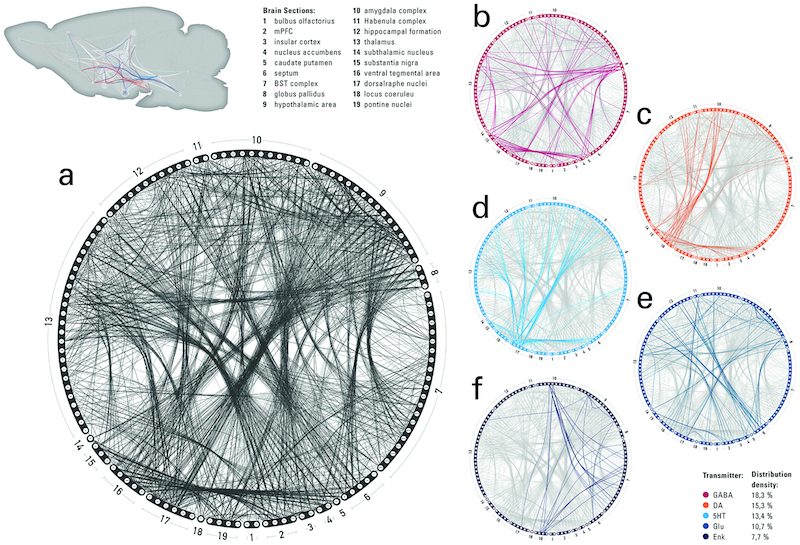 Nineteen large scale brain regions (listed) partition a 125 node cerebral connectome in a. Connectomes in b through f each match the color of a neurotransmitter listed at lower right. Figure 1 from “A multi scale cerebral neurochemical connector of the rat brain” published July 3, 2017 in PLOS Biology. Since the 1960s a lot of scientists have worked very hard, and a lot of rats have given their all, to trace brain connections and their neurotransmitters. Fundamental to understanding how the brain works is to know how it is wired and how the signals are transmitted by those wires. Work reported in a new paper “A multi scale cerebral neurochemical connector of the rat brain” (published July 3, 2017 in PLOS Biology) identified 1,560 original research articles with high quality connectivity data from 36,464 rats from the past 50 years that they transformed into multi scale atlas of rat brain connections and their neurotransmitters. The authors point to three main features ChemNetDB has over other existing databases. 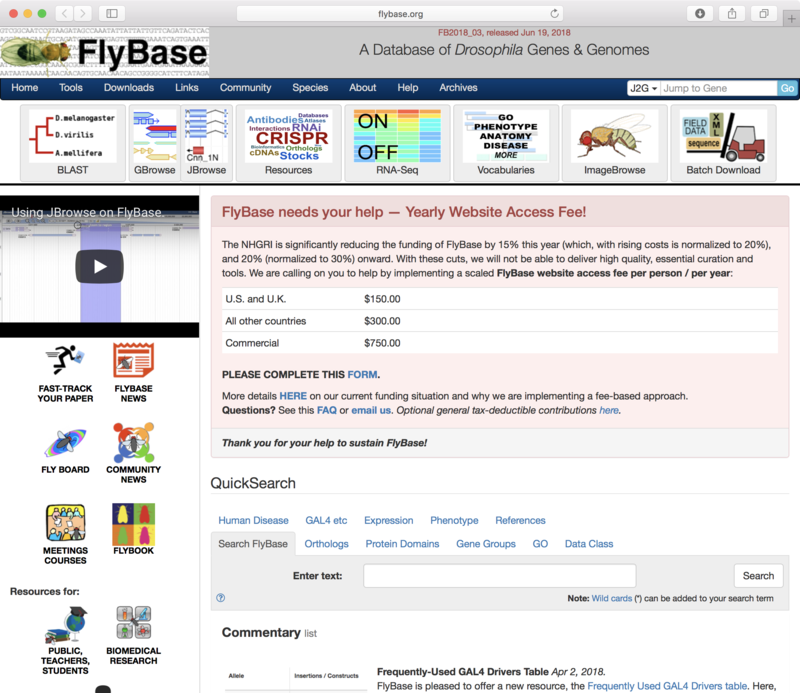 First, they claim that ChemNetDB is the most comprehensive rat connectivity database of the last 50 years of research data currently in existence. Second, they used a transparent, consistent, and validated method to integrate neurochemical information with the connectivity data. And third, they used data from animals of a consistent age along with transparent and consistent terminology. I was very excited on coming across and reading their paper. However, on visiting the site chemnetdb.org I was immediately struck by very limited data access. Perhaps there is a data endpoint or an Application Programming Interface (API). To my knowledge, the best you can currently do on the site is to search a brain area or structure and get a list of the areas connecting with that area or structure along with the connection’s neurotransmitters. Or the reverse: you may search on a neurotransmitter. References associated with the connections are displayed. The authors may have future plans but no hints have been provided. 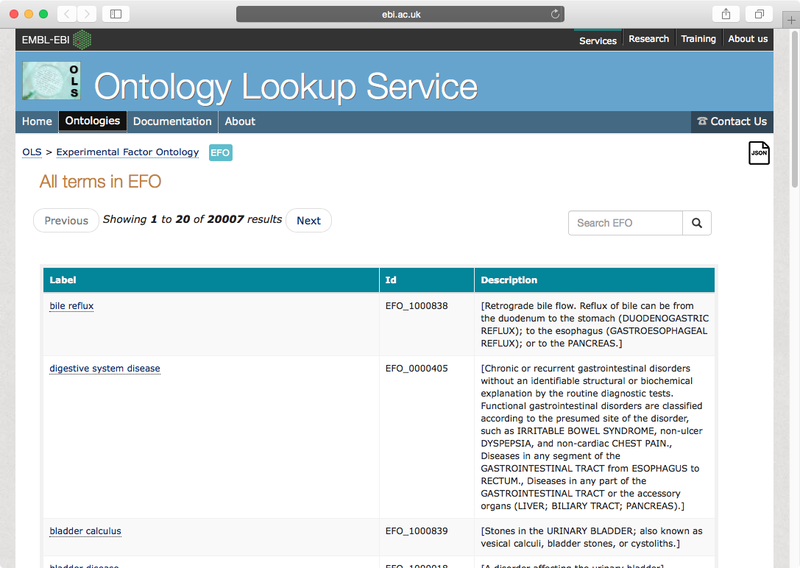 These data would be valuable as part of the rich set of life sciences linked-data available across the Internet. 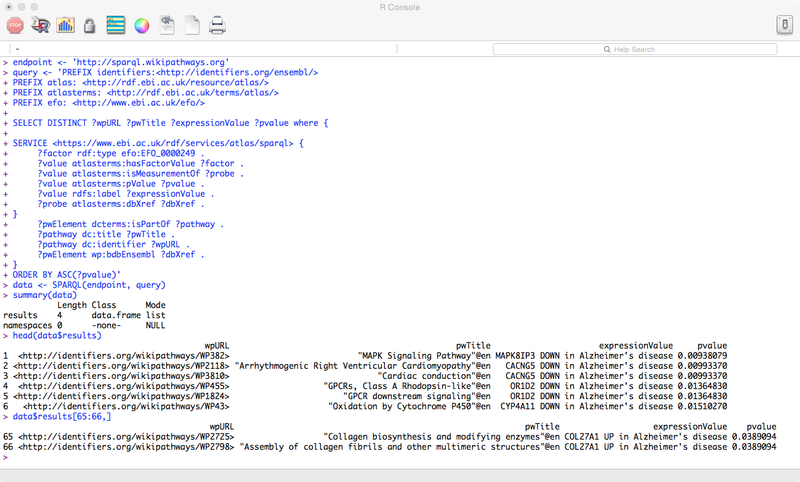 Their rat connectivity data could be associated with with a rat brain anatomy ontology and a huge and growing number of other relevant ontologies and opened up through SPARQL endpoints. Then there would be a world of possibilities! This entry was posted in Brain Science, Open Data, Semantic Web on July 14, 2017 by Donald Doherty.